The worldwide race to attract student talent is getting tougher for universities all over the world. The US has been leading the race, with its ability to attract PhD candidates and graduates from emerging countries and from the European Union. 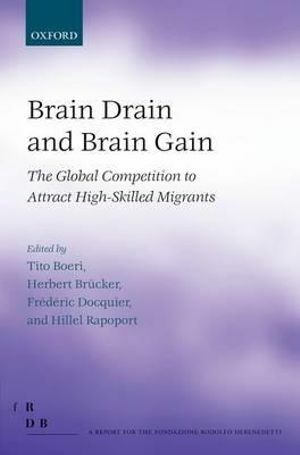 This book provides an overview of how a growing number of countries have adopted immigration policies specifically aimed at selecting and attracting skilled workers and examines the consequences of brain drain for the sending countries. Karin Mayr finds the book offers a valuable collection of academic contributions on this increasingly contested immigration phenomenon. Brain Drain and Brain Gain: The Global Competition to Attract High-Skilled Migrants. Tito Boeri, Herbert Brücker, et al. (eds.) Oxford University Press. July 2012. Throughout history, countries have been competing for resources. The current book analyses competition for a special resource: that of high-skilled workers. It covers the determinants and effects of the phenomenon of high-skilled migration comprehensively from a variety of different angles, with contributions of a number of economists who are among the most active and influential researchers of the topic in their field. The book starts off with a good overview of interesting facts. For example, we learn that at the beginning of this decade, about 20 million immigrants with tertiary education resided in the OECD, representing about 11 per cent of the total highly skilled population living there. More than 50 per cent of those resided in the USA and about 24 per cent in Western Europe, which corresponds to an increase by a factor of 5 in both the USA and Europe between 1975 and 2000. Interestingly, about 40 per cent of the highly skilled immigrants currently living in the OECD originate from other OECD countries. Apart from the migrants themselves, the migration of high-skilled workers affects two broad parties: sending countries and receiving countries. The book considers both two separate parts. One might suspect that the interests of sending and receiving countries run counter to each other, and that the (brain) gain of the one party equals a loss (brain drain) for the other party. However, as the book shows, this is not necessarily the case, and high-skilled migration might be a win-win situation instead. In receiving countries, high-skilled immigrant workers can support stronger growth rates (by improving per capita human capital endowments), and they can reduce earnings inequalities (by participating in national redistributive systems as net payers). In addition, they can exert knowledge spillovers and pressure for skill acquisition amongst native workers. Integration in the receiving countries’ societies is also typically comparatively easy for them. In sending countries, there are also benefits to be gained from the emigration of the high-skilled, even though they may be less obvious. Such benefits exist in the form of an increase in individual incentives to invest in human capital, which can increase average human capital domestically, if not all of the additional high-skilled emigrate, or if they emigrate only temporarily. In addition, remittances as well as network effects favoring international transactions and technology diffusion may more than offset the loss in human capital that comes with the emigration of the high-skilled. Another likely conflict of interest in this context is the one between different potential receiving countries of immigration in their competition for high-skilled immigrants from third countries. However, in contrast to what the subtitle of the book suggests, this battle for brains seems to be in its preliminary stages only. As described in chapter 1, current policies of receiving countries reflect a strong bias towards the status quo. In particular, policy changes at the EU level and within EU member countries have been only incremental so far. In consequence, it looks like that, in the contest for skill, the USA, Australia and Canada will retain their head start for some time to come. Given that the potential benefits from international migration of the high-skilled are large, it is perhaps surprising to learn that only about one quarter of the countries in a UN survey sample has policies in place to attract highly skilled workers (also, only seven OECD countries are net recipients of highly skilled individuals in the OECD – the USA, Australia, Canada, Switzerland, Belgium, Sweden and Luxembourg, while the UK, Korea, Germany and Italy are the main losers). Chapter 5 tackles the question of why high-skilled migration does not take place to a much larger extent and argues that this can be (partially) explained by the opposition of high-skilled natives, who would face negative effects on the labor market. Still, one is left wondering whether there is not more to this puzzle that the book has served to identify at this point. Notwithstanding the current lack of corresponding evidence, chapter 6, finally, considers the welfare changes in sending and receiving countries that could occur, if the competition for high-skilled migrants among different receiving countries intensified as expected. Using a model of strategic interaction between countries, it shows that (all) receiving countries may benefit but sending countries may lose, unless restrictions on the immigration of low-skilled migrants would be eased, as well. This book is a collection of valuable academic contributions on a phenomenon that can rightly be expected to become increasingly contested in the future: the migration of the highly skilled. However, it also shows that currently the discrepancy between the extent to which we would expect high-skilled migration to take place, and the extent to which it actually takes place, is large. Here, political economy models as presented in the book have been able to provide some important insights, but have not yet conclusively resolved the issue. We are left to see whether the global battle for brains will indeed unfold as expected thereby presenting us with the challenge of avoiding a depletion of high-skilled workers as in a tragedy of the commons. Karin Mayr is Assistant Professor at the Department of Economics at the University of Vienna, Austria. She has published a number of papers, among them papers on brain drain and brain gain, on various aspects of international migration in the context of a diversity of fields in economics (e.g., public economics, political economy, labor and growth) in journals such as Public Choice, Regional Science and Urban Economics and the Journal of the European Economic Association. Read more reviews from Karin.